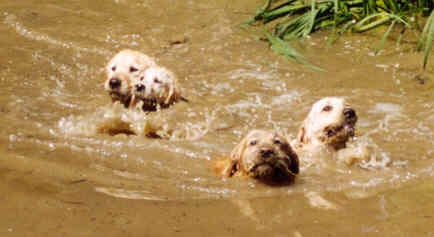 A good friend has made me laugh, she thought that this photo looked like our Golden's were being swept away in a flood. Of course they aren't ~ this is just our Golden family enjoying a swim in our dam, one of their favorite past times. We are interested in all aspects of Golden Retriever ownership, including health and hereditary issues. If you have similar interests or information that we might be interested in please email us, messages with interesting URLs are always welcome. This site will continually be updated and modified - if you find any rough edges please let us know. This Golden Retriever Web Ring" is owned by Michael & Julie Matthews. Surf the web for more golden sites!